Earlier this week, a passerby named Wendy was walking down an alleyway in Stratford, London when she heard something strange — a steady chorus of disembodied meows seemingly coming from nowhere. Upon closer look, she saw a set of cardboard boxes, sealed shut with tape. It was then she realized what she had found — five boxes full of cats. Wendy called a rescue organization and they quickly swooped into action to save the trapped felines. 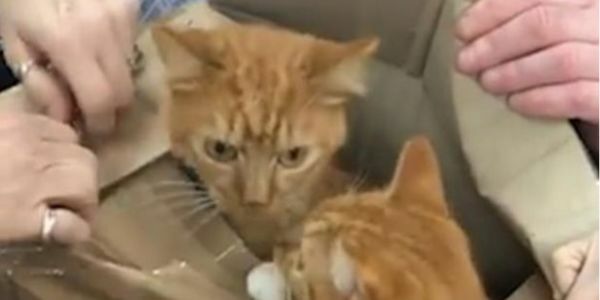 When they took the boxes back to their offices and opened them up they were shocked to see 11 young, flea-ridden and emaciated cats looking back at them. The boxes had been sealed shut with shipping tape and had not a single hole for them to get fresh air. Whoever left them there in the alley clearly didn't care if they lived or died. Luckily someone came along at the exact right time. According to the Celia Hammond Animal Trust — the organization that rescued the cats — all of the eleven cats were friendly. They believe they were loved. But no one knows why someone would suddenly want to round them up and kill them in such a disgusting manner. Now we need your help to demand justice for these cats who almost died a horrible death. Please sign the petition and ask London Police to search for the persons responsible for abandoning these cats and bring them to justice.